Life is short and hell is forever. Is that really fair? and at that time your people, everyone who is found written in the book, will be rescued. And many of those who sleep in the dust of the ground will awake, these to everlasting life, but the others to disgrace and everlasting contempt. "The idea that a good God would send people to a burning hell is utterly damnable to me. The ravings of insanity! Superstition gone to seed! I don't want to have anything to do with such a God." Is eternal damnation fair punishment for not believing that Jesus died for your sins? An eternity of punishment for perhaps no more than seventy or eighty years of unbelief has many times been suggested as seeming quite unfair. There is a very good response to this false perception that God is inequitable. Consider our own system of justice. If someone were convicted of having gone on a ten minute killing spree, about how much time would the law require them to spend in jail? An equal ten minutes? Obviously not. The punishment for any given crime addresses the quality of the crime, not, or not just, the quantitative aspect of the crime. 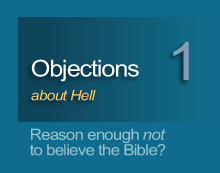 In the Bible's case, the key crime that sends anyone to hell is unbelief. Unbelief rejects God's ultimate sacrifice and is, in effect, equivalent of crucifying Jesus Christ. From a positional perspective, one's spirit is either on that cross crucified with Christ, or is outside of Christ, sided with the world that necessitated his death and bearing their own sin debt. So in a sense it is the infinite quality of Christ's life for which unbelief exacts a correspondingly infinite consequence. An infinitely long sentence for the infinitely bad crime. Simple math. By contrast, the reward of eternal life for even the shortest life lived in true belief has a far greater appearance of being unfair - unfair to God, that is. Without surprise, there is no objection to this side of the coin. Consider the thief who confessed his belief just moments before he died on a cross beside Christ. He received an infinite reward for...what? For simple, true belief. He received an infinitely good consequence for true belief, thanks only to the infinitely good quality of the life of Jesus Christ - the object of that belief. What is likely the nature of hell? What were sacrifices all about? Why can mass-murderers go to heaven, but unbelievers cannot?